I would like to the popcorn snowman assortment. the holiday plaid sampler looks good! How can you not like truffles! lol I love them! I would love to try them or their chocolate covered pretzels. I didn't see it on the site, but i might have missed it, they should have a 'make your own' version of that snowman or buckets. They give you a certain number of treats to pick from, and you fill it with things you want. I didn't see one basket that i liked EVERYTHING in and I hate to see a part of it go to waste that I don't like. You know? Your button is on my blogroll: http://www.pyleoflove.com/2008/11/from-son-up-to-son-down-blogroll.html being all sexah. The Frosty Friends Snack Assortment sounds delicious, also! I'd like to try the Popcorn Bowl & Snacks :) *Thanks* for the giveaway! I'd like to try their popcorn balls, yum! I also entered you Healthy Bread in Five Minutes a Day giveaway! The Snowy Pine Pixies look divine! The Holiday Plaid Sampler looks awesome! I love popcorn in an array of flavors! Snowy Pine Sampler looks good! The Snowy Pine Christmas Cookies look delicious. The big snow sampler looks great. Thanks for the giveaway. I entered the Frito Lay giveaway. Thanks! I like the smiley face sampler box. 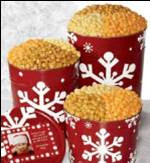 i love the birthday tin that is 19.99. my husbands birthday is Jan 11 and it would be a great gift for him! I'd like to try the Frosty Friends Snack Assortment. I entered the Dean's Dip giveaway. I would love the Color Blox Sampler - the Chocolate Drizzled Caramel sounds yum! I would love to try the Bright Stripe Sampler! I entered your monopoly giveaway! I'd like to try the bright stripe sampler! I'd love the 6 Tier Big snow Tower. Imagine...6 layers of yummy goodness! I like the frosty friends assortment. The Party Pup Party Pack looks good. Thanks! I know Christmas is over but I would love to send a thank you selection to our neighbors who have helped us so much this year. I like the striped tower which has fruit chews, mixed nuts, hard candies, rainbow Crispie Cubes, buttery shortbread cookies and a box of flavor-infused Cheese, White Cheddar and Chocolate Drizzled Caramel popcorn. CHOCOLate drizzled POPCORN??? yum!!! I also entered the Monopoly Championship Game giveaway. thank you! The snack assortment survival tin looks yummy! The Snowy Pine Sampler looks fun and tasty! Get your feed through google. I'd like to try The Ultimate Sweet Stack. Thanks! The Bright Stripes tower has some really yummy stuff included! The Chef-Inspired Popcorn looks really different and interesting! I would like to try the sweet Bavarian pretzels in the Hang in There Basket. Thanks! I think the Hang In There Tin & Tower would be nice to receive! I would love to try the Party Pup Party Pack. All the snacks look great, but I would try the pretzels first. I'd like to try basically anything chocolate!